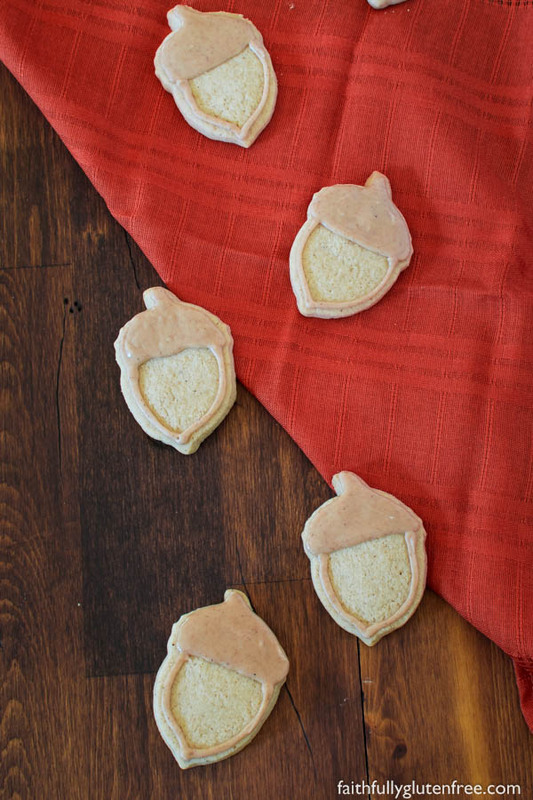 Add a little extra kick to the ordinary with these gluten free Spice Sugar Cookies. Perfect for the holiday cookie trays. I’ve been baking gluten free Rolled Sugar Cookies for years. 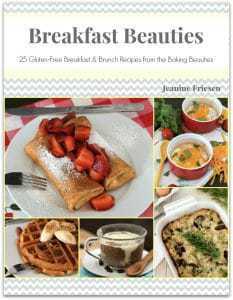 I love that recipe, and many of you have given it rave reviews as well. I use the recipe year round, just using different cookie cutters for the different times of year. Hearts for Valentine’s, bunnies for Easter – that sort of thing. 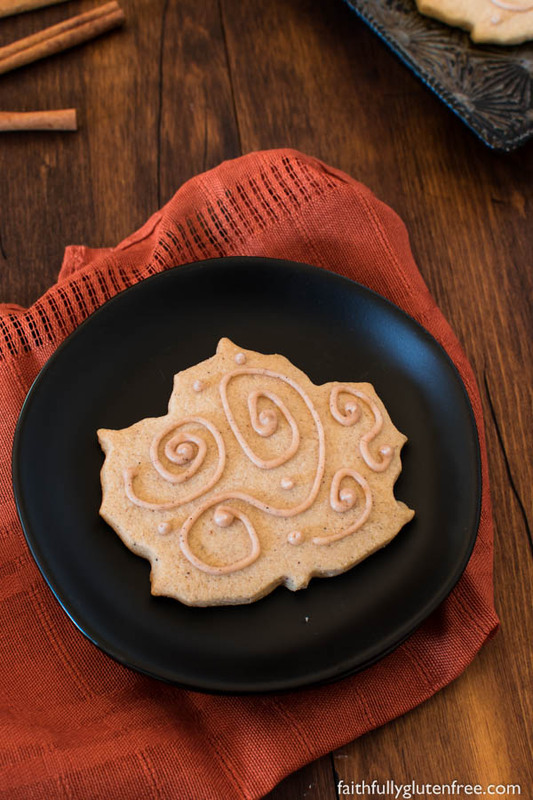 But when I saw a local coffee shop offer up Spice Sugar Cookies at their store for fall – I knew I had to create a gluten free version. I dug out my fall shaped cookie cutters, and went to work. The dough rolled out beautifully, and held it’s shape pretty well when baking too. I decided to use half butter and half shortening, and I really like the cookie that it created. You could use full butter if you wanted though. 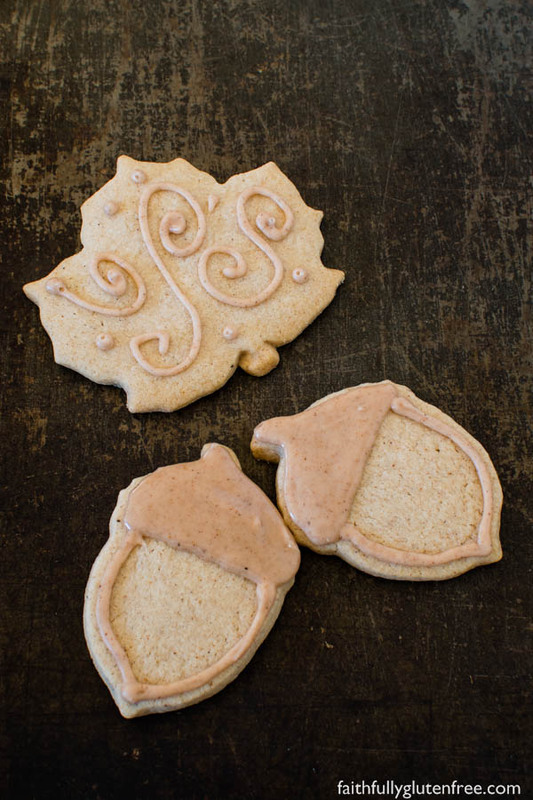 Instead of these autumn shapes, you could always use this Spiced Sugar Cookie recipe to cut out Christmas shapes and just use a regular royal icing to decorate them with. They would be beautiful! 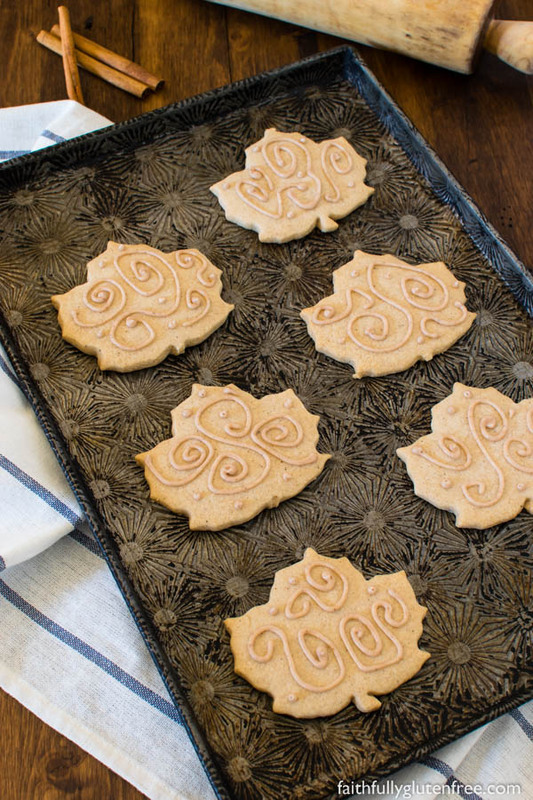 I kept things simple with this recipe – using a simple spiced icing to create some swirls on top of the cookies, but you could go all-out if you want. We found that the texture of this cookie actually improved on days 2 and on. Fresh from the oven, it is a very fragile cookie. But when you let it age a little, the texture actually does change. And the spices have a chance to meld more as well. So, keep that in mind. They are great to make ahead of time. In the bowl of a stand mixer on medium speed, beat the sugar, shortening, and softened butter until fully incorporated. Reduce the speed to low and add the egg and vanilla. Mix just until blended. In a separate mixing bowl, whisk together the rice flour, potato starch, tapioca starch, xanthan gum, cinnamon, baking powder, and nutmeg. With the mixer on low speed, slowly add the dry ingredients, scraping down the bowl as necessary. Mix just until the dough comes together. Scrape the dough out onto a sheet of plastic wrap, and wrap tightly before refrigerating for at least 1 hour. This will help your butter to solidify and help your cookies to keep their shape while baking. When you are ready to bake, preheat your oven to 350 degrees F and line your baking sheets with parchment paper. Working with a quarter of the dough at a time, roll the dough to about 3/8-inch thick between two sheets of plastic wrap, dusting with a small amount of sweet rice flour if necessary. Cut to desired shapes and place on prepared baking sheets, leaving 2-inches between cookies. You can re-roll the scraps until all the dough has been used. Bake in preheated oven for 8-12 minutes, depending on the size of your cookies. The cookies should just barely be turning brown around the edges, and have just a light brown colour on the bottom of the cookie. Let cookies sit on the baking sheet for 5 minutes before removing to a cooling rack. Allow cookies to cool completely before decorating with icing or storing in an air-tight container. Mix together all ingredients until fully incorporated. Scrape the icing into a piping bag fitted with a small round tip (I used a Wilton #3 tip). Get creative and decorate. Let the icing dry before stacking the cookies in a container. Be sure to place waxed paper between layers. Do you dip your measuring cups into the flour or spoon in and level off? Makes a big difference. It would be good to mention the way you measure flour as so many books and blogs emphasize spooning and leveling off. Thanks for working out so many “doable” recipes. Would grams actually help? I don’t see many bloggers including it. I could add it, just takes more time to figure, but I could. Jeanine, these cookies are beautiful! I’m not sure if I could change the recipe to make them with paleo flour though. Our daughter is now on a semi paleo diet, since she can no longer tolerate rice and other usual gluten free flours. It’s easier to bake one kind of thing for both of us. Thanks, Jeanne! We’re doing well! I would add the spices to the Paleo Sugar Cookies recipe I linked to above, I’m sure adding some spices wouldn’t change the results of the cookie – should work! What brand brown rice flour do you use. I generally stay away from rice flours because of the grainy texture, These look yummy! I use Bob Red Mill’s. I think it has a lot to do with how things are combined as to the texture. I’ve also heard that you can let your dough/batter sit for 30 minutes before baking, and that will help with grittiness.